Our family loved a dessert we had at a local restaurant, so I invented my own version for a birthday party,, It was a big hit. It's simple to make ahead and just pull out of the freezer when you need it. Place crushed pretzels in a small bowl; cut in butter until crumbly. Press onto the bottom of a greased 9-in. springform pan. Cover and freeze for at least 30 minutes. Spread fudge topping over crust; cover and freeze. Set aside 16 chocolate-covered pretzels for garnish. Place remaining pretzels in a food processor; cover and process until crumbly. Transfer to a large bowl; stir in ice cream. Spread over fudge topping. Drizzle with caramel topping. Garnish with reserved pretzels. Cover and freeze for at least 8 hours or overnight. Yield: 16 servings. Note: If you are unable to find chocolate-coated pretzels, use 1 package (11-1/2 ounces) milk chocolate chips, 4 teaspoons shortening and about 110 miniature pretzel twists. In a microwave, melt chips and shortening; stir until blended. 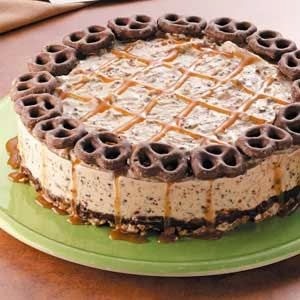 With a fork, dip pretzels into chocolate mixture to evenly coat, reheating chocolate if needed. Let stand on waxed paper until set.